Sometimes dinner is all how simplicity! As a simple home cook sometimes it can be challenge to make something simple for dinner while still ensuring it turns out amazing. The other evening I was talking to my husband about one of our favorite restaurants, and how I just love their pizza and their quesadillas while I was contemplating what I was going to make us for dinner that evening. As I opened all of our cupboard doors looking to see what my options were, I noticed a bag of tortillas that had been laying on the counter for a week, with my husband’s package of turkey pepperoni laying right next to it. All of a sudden it hit me that I should try making a pizza quesadilla! I searched through the cupboards and found a jar of pizza sauce and I always carry mozzarella cheese in the house, so I knew we were set there. 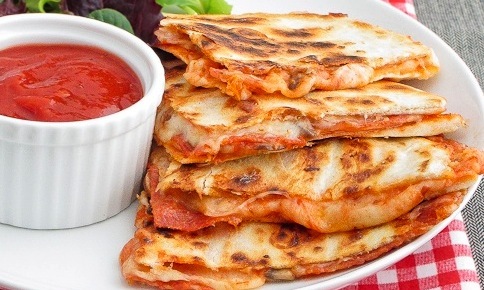 These pizza quesadillas turned out amazing! The best part about them was how quick and easy they were. These quesadillas are also incredibly easy to “customize”. Each person can add different toppings to make their quesadilla exactly how they want it! Hope you enjoy! Heat a medium sized skillet over medium heat. Lay the tortilla out on a cutting board and lightly butter one side. Flip the tortilla over and spread out a thin layer of the pizza sauce. Sprinkle the cheese over half of the tortilla and top with pepperoni along with any other desired toppings. Fold the tortilla in half and place butter side down in the hot skillet. Cook the tortilla until it is nice and browned (about 3-5 minutes) and then flip the tortilla over cooking until the second side in nice and brown (an additional 3-5 minutes). Remove the quesadilla from the skillet and slice into 3 equal pieces. Serve with additional pizza sauce for dipping. Throughout the holidays I am constantly making snacks and goodies that are kid friendly. 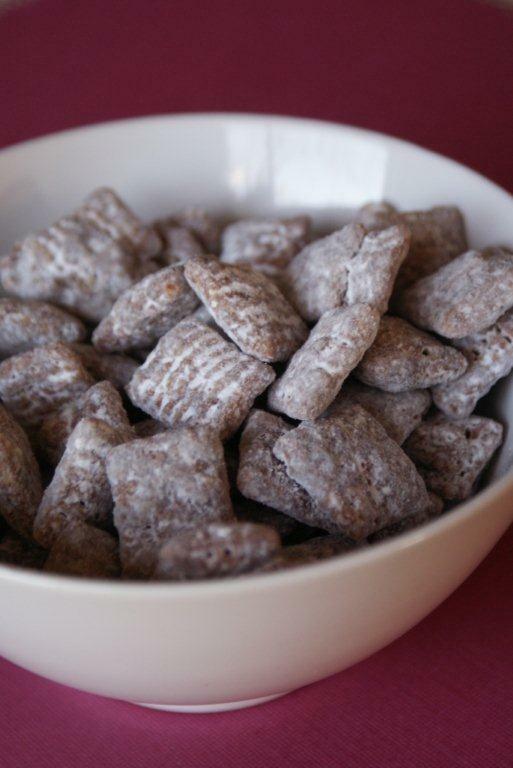 One of the kids favorite snacks that I usually only make around the holiday season is Chex’s Muddy Buddy Mix! A great mix of my two favorite things: Chocolate and Peanut Butter! This recipe is simple, yet is a great item to have out for munching that everyone just loves! In a large mixing bowl, measure out the 9 cups of Chex mix and set aside. In a medium sized microwave safe bowl, microwave the chocolate chips, peanut butter and butter on high for 1 minute and then stir. Microwave for 30 seconds at a time, stirring each time until mixture is smooth and stirs easily. Stir in the vanilla. Pour the chocolate and peanut butter mixture over of the cereal and stir until the cereal is coated evenly. Add half the powdered sugar into a 2 gallon resealable plastic bag, add in the cereal and add the remaining powdered sugar. Seal the bag and shake well until coated. On a baking sheet covered with wax paper, spread out the mixture in order to cool. Once completely cooled store in an airtight container in the refrigerator.